When it comes to getting firm quotes, I strongly recommend that you have a physical site inspection. I understand the sentiment. If you want really ballpark figures, I maintain a list of the approximate cost of good-quality solar systems here: solarquotes.com.au/cost. Just be aware that those prices can vary by thousands of dollars depending on your home’s layout and the condition of your roof. If the prices on that page don’t have you running for the hills then the next step, in all honesty, is to have each solar installer or salesperson come round and assess how suitable your home is for solar power. A valid reason for resisting a site inspection is that you’ve heard reports of some solar salespeople pressuring people into buying. I believe this is completely unacceptable. If anyone selling solar tries to get you to sign anything without giving you the courtesy of going away so you can consider your options, my advice is to decline their offer. Oh, and while we’re on the subject, if you ever come across one of the special breed of jerks who try to get you to waive your cooling-off period, please kick them out of the door first, report them to ACCC second, and, third, let me know so I can put them on my blacklist. 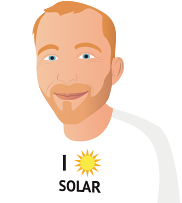 The reality is that most solar salespeople and solar installers are really nice people who just want to come round so they can be sure that they recommend a system that suits your electricity usage patterns and your home. Of course, they also want the opportunity to impress on you why their solution is the best, but that’s all part of the fun. You can look the installer or salesperson in the eye. Assess their competence by asking some tough questions. If they can’t answer them or they look panicked, end the visit promptly and move on. Your roof needs checking. The installers need to check the condition of your roof if it’s more than ten years old. It may need repairs before anything is installed. You really don’t want to have to remove your solar panels to repair your roof a few months or years down the line. Shade needs assessing. If you have any shade on your roof at all, an installer can’t assess how much that will hurt your solar-power system using Google Earth. Cables need routing. The installers need to assess how they’re going to get the cables from the solar panels to the inverter with as little modification to your house as possible. Switchboard may need upgrading. They need to look at your switchboard to see if it needs upgrading and if there is space inside it for an extra circuit breaker. Inverter location needs deciding. The installer needs to scope out a place for the inverter where it is nicely shaded, out of harm’s way, and as close to the meter as possible. Panel locations need reviewing. If you’re getting a big system (at least 5 kW), roof space is likely to be at a premium. You should really get a more accurate measurement than Google Maps can provide. Also, you may need to split your solar panels over multiple roof areas. If this is the case, you’re much more likely to get a better designed, better performing system if the designer can visit your home. Future battery location needs considering. Most solar homes in Australia will add batteries at some point. Preempting where they might go and finding an appropriate place for the solar inverter makes a lot of sense if you have one eye on the future. Energy consumption needs measuring. Having a look at your home and appliances and chatting about your lifestyle will give a good solar installer a great feel for your self-consumption ratio (if you haven’t measured it) and opportunities to improve it, which will make your solar payback even better. Having said all that, you may want a small system, have no interest in getting batteries in the future, and have a recently built home with a massive north-facing roof, a modern switchboard and no trees or other shading issues whatsoever. In that case, you could argue that buying solar without an inspection is pretty low risk – and it is. Even if you’re only paying $4,500 for a small 3 kW system, though, don’t forget that with the rebate, it’s actually closer to $7,000 worth of gear that you’ll use every day for the next 20-plus years. An inspection will hugely increase the chance that you get a system that performs well and makes you happy. It’s kind of a no-brainer, isn’t it?